Throughout my marketing career, I’ve been trained to look for places where automation can help us improve processes in the funnel. 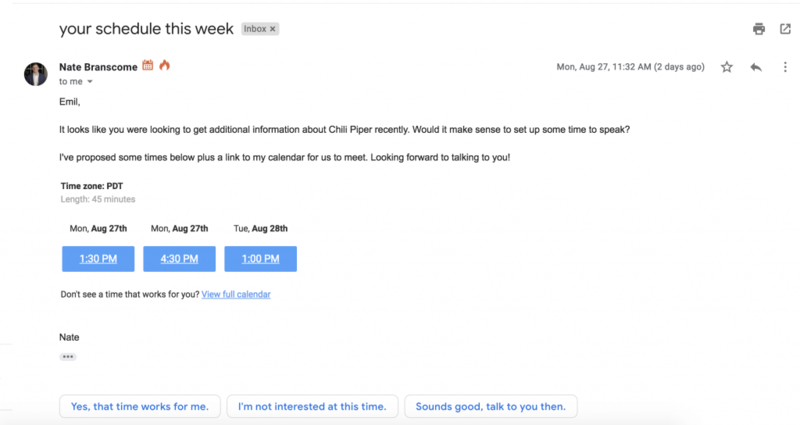 So one of the first things I noticed when I started working at Chili Piper was that our sales team was manually following up with all of our leads who didn’t book a meeting or trigger a call with us through our web form integration. “Easy win,” I thought. Let’s automate that. We started sending an automated email to everyone who fell into this “no book” bucket. But something strange was happening. About 20-30 automated emails in, I took a look into our email analytics and noticed that nobody was clicking through to book a meeting with their assigned rep. I was chatting with the sales team about these results over one of our daily huddles and 2 people told me they previously had more luck sending people suggested times over sending just a link to their calendar. Anecdotal, of course, but that was what they were noticing. So we decided to put it to a test and get the data. 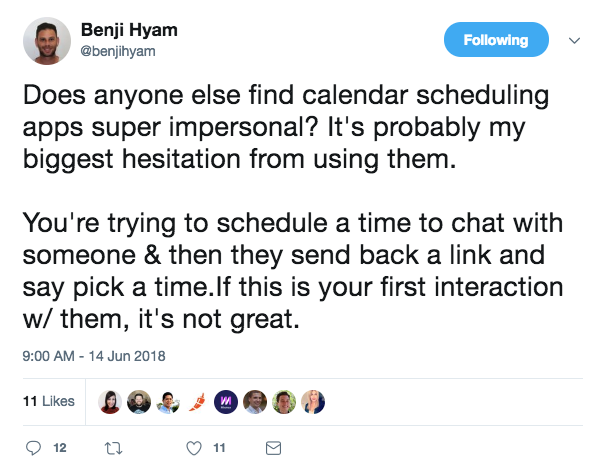 Send 50 emails to with a link to their rep’s calendar, then have the reps send another 50 emails with suggested times in it to book a meeting. I looked into it and the 1 person who clicked the link in the email did in fact book time with our team. So the conversion rate on sending a follow-up email with a link to their calendar resulted in a 1.9% conversion rate. Just by taking a little extra time to put in some effort and make the recipient’s life easier, we were able to 13x the number of people who we got to book a demo with us. Nuts. In retrospect, I’m not at all surprised that the suggested times email was more effective. I just wasn’t expecting such a massive increase in the action we wanted. Where else can we apply these learnings? 1. We removed friction and made the email recipient’s decision making process easier. Clicking on a link and choosing a time for yourself isn’t hard at all. But making my work as the recipient just to click on a time slot that works for me? Much easier in terms of perception. 2. We took the time to make a suggestion and people appreciate that. If you think about it, sending someone a link is putting the work on them. It shows no effort on your part to help find a good time to meet. And apparently I’m not alone in thinking this way. It feels personalized when you send somebody a list of options instead of saying “here, you choose”. Make life easier for people and good things happen. Funny how simple, yet effective that is.